As seen on CBS's "The Doctors" The Pearl laser was utilized by Dr. Ordon to treat brown & red spots and to improve the texture of his patient's skin by eliminating fine lines and reducing pore size. The patient claimed the procedure was virtually painless but she did have three days of downtime. New Pearl Fractional Procedure - Ablative Fractional Resurfacing in just one treatment. What is the Pearl procedure? The Pearl procedure combines the impact of resurfacing lasers with the gentleness and safety of non-invasive procedures to treat aging and sun-damaged skin. Pearl reduces wrinkles, uneven texture and solar damage with fewer treatments and less overall recovery than other technologies to provide a healthy, pearl-like glow. How does the Pearl treatment work? 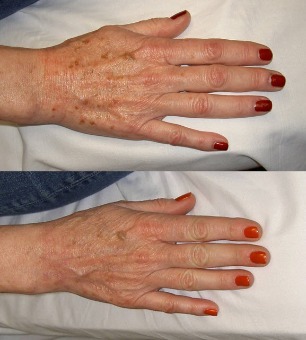 During the procedure, the top layer of skin is treated with pulses of light in a pre-selected pattern. The laser simultaneously sends heat to the deeper layers of skin to provide longer-term benefits. A natural protective dressing forms on the skin to minimize downtime during the restorative process. On day 3 or 4, this natural dressing will peel or slough off, leaving new, healthy, vibrant skin underneath. 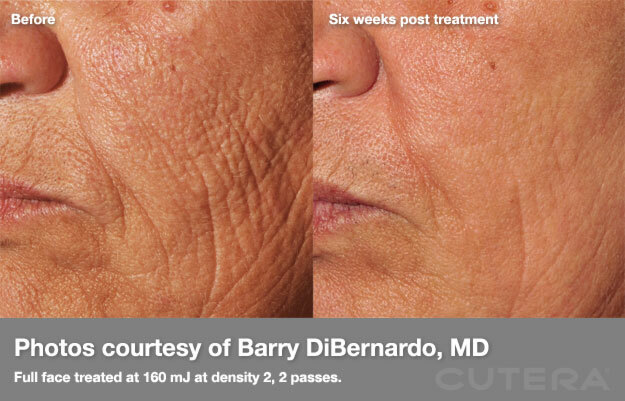 In a short time, patients will notice overall skin clarity, smoothness and softness - all from a 15 minute treatment with only 3 - 4 days of "social" downtime.